As most of you saw in my recent ASOS Haul I decided to treat myself to the Nars Pierre Hardy Blush in ‘Rotonde’, which i’d had my eye for quite some time so I finally took the plunge and ordered it and i’m so happy I did! A lot of you asked for a review on this and now that i’ve been using it for a couple of weeks I thought it was about time. This review is quite photo heavy by the way. As part of the Nars Pierre Hardy collection they released two blush shades, as I prefer using more bronzier shades I opted for Rotonde rather than ‘Boys Don’t Cry’, which is more pinker blush. As you can see the Nars Pierre Hardy Blush in ‘Rotonde‘ is a bright and rather scary looking orange toned blush which blends really nicely into my cheeks and adds a really nice bit of colour to my complexion. I usually use my Real Techniques Blush Brush (review here) to apply this using the smallest amount possible (otherwise i’d look like a clown) and lightly dust over the cheeks bones. I sometimes blend this into my neckline also, especially if I have fake tanned as it helps to even out the difference of skin tone between my neck and face. What really drew me towards this blusher is the really cool geometric pattern with the shimmer running through, unfortunately this pretty much disappeared after about a week but I think that was probably just for decorative purposes as it didn’t really add any shimmer to my cheek bones when applying it. Also as you can see from the image above, this blusher is a lot bigger than my Nars ‘Luster’ Blush (review here) which is definitely reflected in the almost £10 difference in price but this shows that this blush is going to last me a long time to come seeing as I haven’t even broken pan on my Luster blush. I almost find the Nars Blushers are like investment pieces to my makeup collection as I know they will last me a really long amount of time. 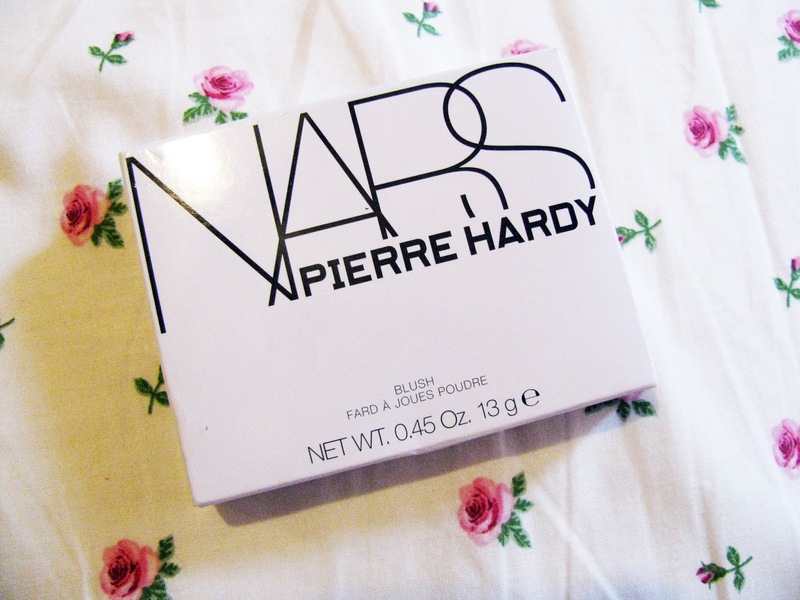 Have you tried any products from the Nars Pierre Hardy collection?